Julian, the young cousin of the Emperor Constantius, has been named to recover the situation in the West after a short civil war opened the frontier to raids and invasion by Franks and Alamanni tribes. Scarcely 23, with no military training, Julian might seem a poor choice, but he proved to be surprisingly effective. After a first campaign rebuilding fortresses and tribal relationships, he focused on the Alamanni, who were not willing to leave lands they now considered to be their own. Julian set up a clever pincer movement to trap and destroy them, but appears to have been betrayed (at Constantius’ orders) by the field marshal who was supposed to close the trap (and who had the larger force.) 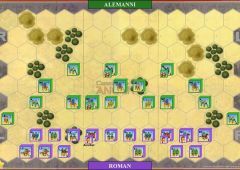 Julian now faced the “trapped” Alamanni with a much smaller army than anticipated, but Julian’s generals convinced him that the Alammani concentration was an opportunity for them to use their skills to destroy the tribes. As with most ancient battles, troop numbers are hard to define, but we do know that the Romans had vastly superior cavalry, both in numbers and quality. Chnodomar, the Alamanni leader, knew this also and chose a position with one flank completely blocked by woods and concentrated his cavalry force on the other. He also mingled light troops with his cavalry, mostly hidden in tall grass or grain fields, aiming to surprise the heavily armored Roman cavalry and strike at their mounts from below. The Alamanni force was a mixture of some very good warrior bands, noble household troops, and less effective tribal levies. 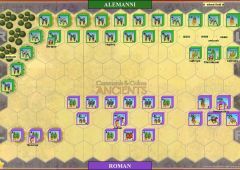 The Roman army included some of the finest troops remaining in the empire, along with some of the tribal limitanei units that Julian had managed to re-recruit. 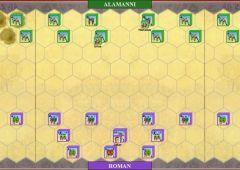 The Alamanni had a custom of expecting their leaders to dismount and fight on foot in the front ranks, which is why they have limited value in the scenario. They do have more leaders, however. 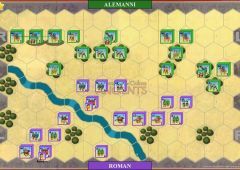 Julian looked for a quick knock-out punch with his cavalry, but Chnodomar’s trap worked well and much of the Roman cavalry retreated in disorder, unnerving the infantry in the center. 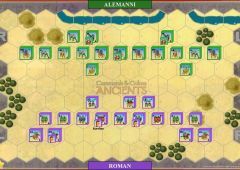 Seeing this, the Alamanni charged along the whole length of their line, finally breaking through the Roman center with a “hogshead” formation that was barely contained by 2nd line troops. On the left, Severus finished off an ‘ambush’ placed for him in the woods and now flanked the enemy in the center, while the rallied Roman cavalry pressed in on the right. As the Roman wings overlapped, the Germans were compressed too tightly to battle effectively, and the army dissolved into rout. Due to Roman fatigue and the lateness of the day, losses in the pursuit were minimal, but Chnodomar was captured and died in captivity. Julian would eventually become sole emperor, but died in an eastern skirmish after only two years. In that time, his efforts to revive the old pagan traditions earned him the name, “Julian the Apostate.” But that is another story. • The Alamanni have five leaders, but each leader only provides combat benefits for the unit he is attached to (not adjacent units). to the attacked LC. For this attack only, the LI rolls 3 dice, hits on swords, and no flags can be ignored. The LI is normal for the rest of the game. • The Roman War Machine may be placed anywhere within 2 hexes of the Roman board edge. • Chrondomar may be placed with any one of the 6 units separate on the Alamanni Left. Serapio may be placed with any unit in the Forest hexes. • Westralp may be placed with any unit in the Center section. • If Julian is killed, Roman Command is reduced by 1. • Severus may be placed with any unit in the cluster of 6 units on the Roman left. • The Roman cavalry commander may be placed with any cavalry unit. • Imperial Roman Legions Rule is in effect. 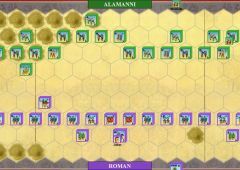 "To simulate the Alamanni ambush, when an “Order Light Troops” Command card is played by Alamanni player, place two light infantry units from off board, adjacent to any Roman cavalry units on the Roman right section. These two light infantry units are ordered in addition to number of Light units ordered by the “Order Light Troops” Command card. Once these two light infantry units are placed the function like light infantry for the rest of the game"